The Samadhan scheme was officially announced on 12th July 2017 by KC Veeramani in the state’s Assembly meeting. The government has announced that the collection of pending commercial taxes shall be effective from 1st July 2017, right after the implementation of GST in the state. Apart from this the state government has also made it very clear that it shall be calculating the pending arrears in VAT right up to June 30th This is also the date when the Samadhan Yojana will be introduced. 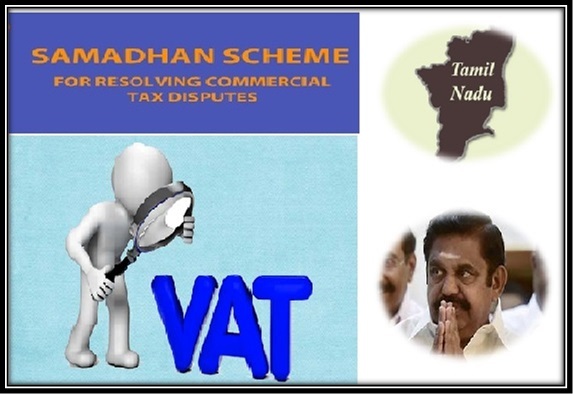 It is certain that the government of Tamil Nadu has introduced this scheme with an aim to help the state government collect all pending Tax arrears from commercial business owners. It is certain that tax department for commercial business has collected over Rs 67,576.77 crore as tax for the fiscal year 2016-17. It is also certain that the tax department had already earned over 10.13 percent more tax as compared to fiscal year 2015-16. With the introduction of the Samadhan Yojana it is certain that the tax department expects to collect more tax from commercial businesses as compared to previous year due to demonetization or any other factors. The state government also expects GST to have impact on commercial tax as a number of provisions under the tax bill in the state has been modified presently. It is also certain that the state has played a positive and proactive role in the implementation of the GST. With the introduction of Samadhan Scheme it is certain that the state government aims at collecting over Rs 1000 crore as pending tax amount for previous year. To make it more effective the state government has announced setting up CCTV in around ten commercial tax offices. For installing CCTV it is certain that the state government has set a budget of around Rs 142.32 lakh.